These memorials are of outstanding universal value as bearing unique testimony to the Protestant Reformation, which was one of the most significant events in the religious and political history of the world, and as outstanding examples of 19th-century historicism. They are all associated with the lives of Martin Luther and his fellow-reformer Melanchthon. In the 15th and 16th centuries Eisleben owed its great prosperity to copper and silver mining, Martin Luther was born there on 10 November 1483 at lodgings in a house in a street then known as Lange Gasse. The family moved in the following year to Mansfeld, some 10 km distant from Eisleben. After studying philosophy at Erfurt University, Martin Luther joined the Augustinian Order in 1505. He stayed there until 1510 when he transferred to the newly built Augustinian monastery at Wittenberg, where he also held the chair of Bible studies at the University. 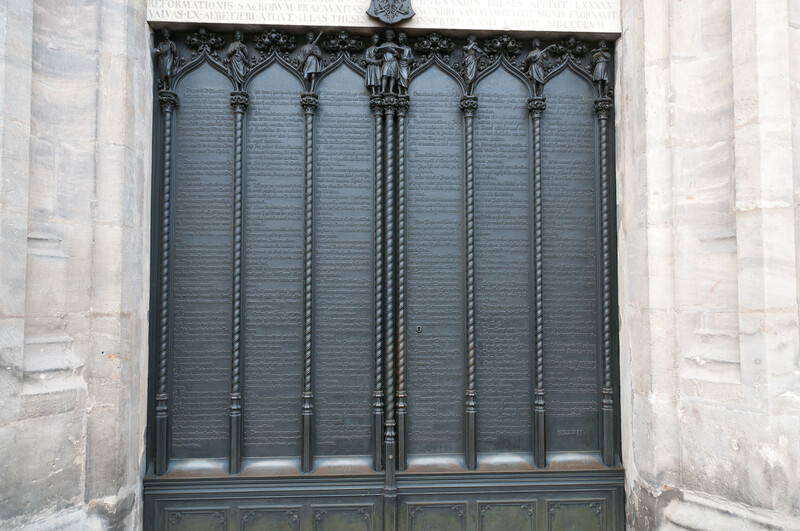 Two years later, on 31 October 1517, he launched the Reformation by nailing his 95 Propositions to the north door of the Castle Church in Wittenberg. Wittenberg is a small community in Germany which was the starting point for one of the most significant changes in European in the last 1,000 years: the Protestant Reformation. 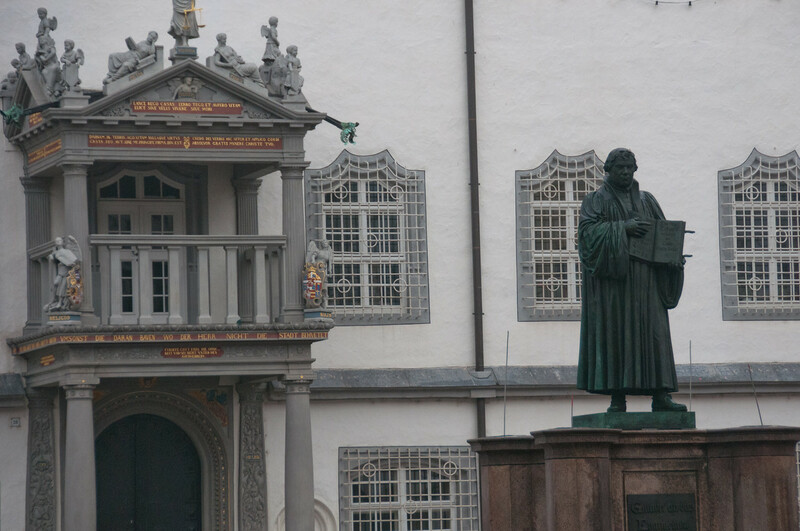 Given the size of Wittenberg, it is difficult to escape the presence of Martin Luther. 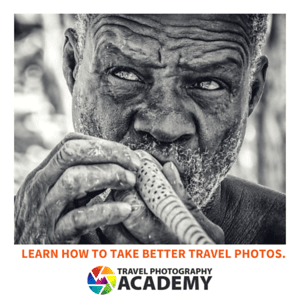 You will see Martin Luther streets, statues, festivals, and historical markers all over. 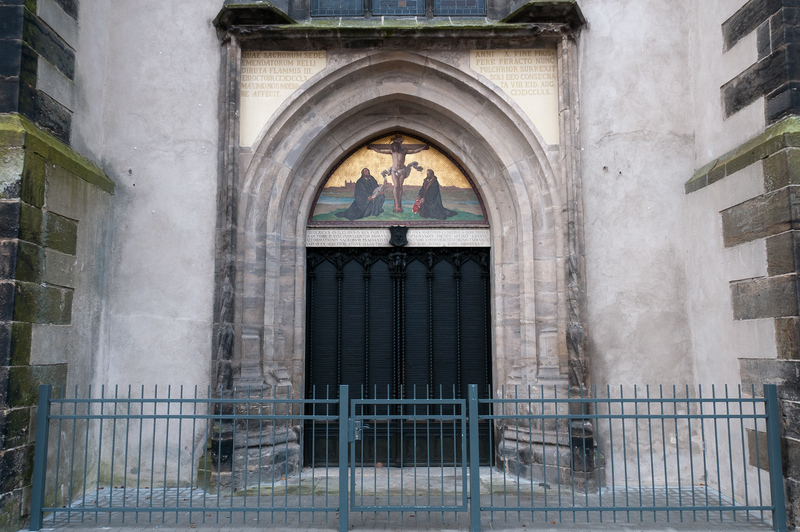 The most significant buildings in Wittenberg pertaining to Martin Luther are the Castle Church where he nailed the 95 Theses to the door, the town church where he preached and the Martin Luther house. You could easily explore the main Luther historic sites in half a day. UNESCO locations in Wittenberg are a 10-15 minute walk from the Wittenberg train station. Wittenberg can be easily reached by train from Leipzig or Berlin and Wittenberg could be visited on a day trip from either city. The Luther Memorials in Eisleben and Wittenberg is a cultural UNESCO World Heritage Site in Germany. It consists of Christian and religious structures in the towns of Eisleben and Wittenberg. The site was inscribed into the list of UNESCO World Heritage Sites in 1996. These sites were considered of cultural value by the UNESCO committee as they represent the Protestant Reformation during the 16th century. Located in East Germany, these two towns have close links to the lives and works of Martin Luther, along with a fellow Reformer Melanchthon. There are several structures included in the protected area for Luther Memorials in Eisleben and Wittenberg. In particular, it includes the house where Martin Luther was born in on 1483 in Eisleben. The house where he died in on 1546 was also included among the protected sites. Other sites included were his room in Wittenberg, and the castle and local church where he posted his ’95 Theses’ that launched the Reformation. Luther Hall in Wittenburg: The Luther House, or Lutherhalle, is the most significant and interesting structure that was included in the WHS Luther Memorials in Eisleben and Wittenberg. The Luther House is located within the Augustinian monastery that Luther called home, wherein he was initially a monk. Eventually, the property became his and that of his family. Inside this structure, there are plenty of well-preserved rooms and a museum that houses a collection of Reformation artifacts and manuscripts. Luther’s Birthplace in Eisleben: The house where Martin Luther was born in is part of the World Heritage Site. The house was built in the mid-15th century as a burgher’s home. The Luther family rented it before Martin Luther was born. The actual house was burnt to the ground in 1689 but a new structure was built in its place. To this day, the building is open to the public (since 1693) and is part of the World Heritage Site that honors the memory of Martin Luther. Melanchthon’s House: This was the former home of Phillip Melanchthon, who together with Martin Luther was the proponent of the Reformation. This 16th century Renaissance style home is where Melanchthon lived and worked until his death. From 2010 to 2013, the house was turned into a memorial and was expanded to add a new building. The annex contains new features such as a museum shop, ticket counter, and additional space for exhibition. Wittenberg’s All Saints’ Church (also known as Schlosskirche): This church was included in the world heritage site Luther Memorials in Eisleben and Wittenberg as it is known as the Reformation Memorial Church. This is where Martin Luther posted his 95 Theses in 1517. Many believe that this act started the movement towards Protestant Reformation. In 1883, the church was restored and converted into a memorial site. Town Church of Wittenberg (also known as Stadtkirche): The town church is Wittenberg is also a civic church wherein Luther preached about the Protestant Reformation movement. Many believe it is the mother church of the Protestant Reformation. Martin Luther’s Death House: This is the final site that was included in the multi-site property in UNESCO: Luther Memorials in Eisleben and Wittenberg. This historic building is located in Eisleben wherein many incorrectly thought is where he died in 1546. Despite that, the building is now converted into a museum and is part of the UNESCO site that honors the memorial of Martin Luther and his works for the Protestant Reformation. Nice one, Each and every thing is looking very nice there and specially that pic which is fixed at above of door increasing more beauty of this place.